There are a number of common disorders of the joints that do not fit clearly into the categories on this website. They are discussed in here to cover the pathology that is regularly seen in musculoskeletal clinics. The tendon of supraspinatis, one of the rotator cuff muscles, runs under the acromion and the acromioclavicular joint (ACJ) and functions to abduct the shoulder. The tendon is protected from the undersurface of the acromion by a bursa that allows it to glide smoothly in this tight space. Anatomical abnormality in the shape of the acromion or degeneration with formation of spurs on the underside of the ACJ can lead to the tendon rubbing painfully against these structures, leading to inflammation within the bursa and tendon and possibly to eventual tendon damage and rupture. Young patients presenting with impingement must have shoulder instability ruled out as a cause of their impingement. The patient presents with pain upon initiating abduction and worsening with overhead movements. The impingement test will be positive with limited abduction of the shoulder. X-rays may show a downward sloping acromion or ACJ spurring. MRI shows inflammation within the tendon and bursa and will determine if there is overt damage to the tendon. rotator cuff tear, some more symptomatic than others. Patients describe an insidious onset of pain and weakness with pain worsened with overhead movements. Examination will reveal reduced range of motion and weakness on testing of the specific rotator cuff muscles. X-rays may be normal but chronic disease may show superior migration of the humeral head (due to the unresisted pull of deltoid) or evidence of glenohumeral arthritis. sometimes occurring due to epileptic seizure, electroconvulsive therapy or electrocution. Treatment requires urgent reduction utilising analgesia and sedation with various traction manoeuvres described. Assessment of axillary nerve function (sensation in the regimental badge region – known as the stars and stripes area in the US - and deltoid motor function) must be performed before and after reduction as this nerve may be damaged during dislocation or reduction. The shoulder is immobilised in a sling (with some controversy regarding a sling in external rotation versus internal rotation), followed by physiotherapy led rotator cuff strengthening exercises. stabilisation to prevent recurrence and this may be performed as open or arthroscopic surgery. If there is bony involvement, this needs to be dealt with at the time of surgery or the resulting stability may be compromised. Repetitive rotation with the forearm in extension may result in a micro-tear of the common extensor origin at the elbow (lateral epicondyle) with a deranged healing response, leading to a chronic inflammatory response. This leads to pain and localised tenderness, worsened with resisted wrist extension. Initial treatment involves activity modification, compression braces, stretching exercises and ultrasonic massage, and NSAIDs. Localised steroid injections combined with these other conservative measures may be beneficial in up to 95% of cases. Unremitting symptoms may require open surgical debridement. structure. Through this tunnel runs the median nerve, accompanied by 9 flexor tendons. Any change in the volume of the tunnel, for example, due to swelling (rheumatoid arthritis), trauma (distal radius fracture and haematoma) or mass lesion (lipoma or ganglion) will compress the nerve, leading to symptoms, although the majority of carpal tunnel syndrome cases are idiopathic. Patients complain of intermittent numbness with pins and needles affecting the thumb, index, middle and radial half of the ring finger. There may be associated weakness and wasting of the thenar eminence muscles. Physical tests include Phalen’s test (holding wrist in flexion for 60 seconds to bring on symptoms) and Tinel’s test (tapping over carpal tunnel to exacerbate symptoms) and may be reinforced with nerve conduction testing. for some recovery to be seen. Risks include recurrence, nerve damage and scar sensitivity. simple radial or longitudinal tears or more complex “bucket-handle” tears with a portion of the damaged meniscus flipping into the joint. The peripheral 1/3 of the meniscus is vascular and tears involving this region have a chance of healing whilst the central 2/3 are unlikely to heal due to avascularity. A patient with an acute meniscal tear will describe a twisting injury with sudden onset of pain on either the medial or lateral side of the joint with swelling developing over 12-24 hours. The patient will present with pain and a limited range of motion and an effusion. Investigate initially with X-rays to rule out a fracture but continued symptoms are investigated with MRI. MRI will show the extent of the tear and associated ligament disruption or bony injury. Treatment may be conservative if the pain settles and the patient can achieve a full range of motion (particularly full extension) once the effusion has resolved. If there is evidence of a peripheral (repairable) tear or there is a block to full extension (due to a flipped bucket handle tear), a knee arthroscopy with meniscal repair (via sutures) or partial excision may be performed. 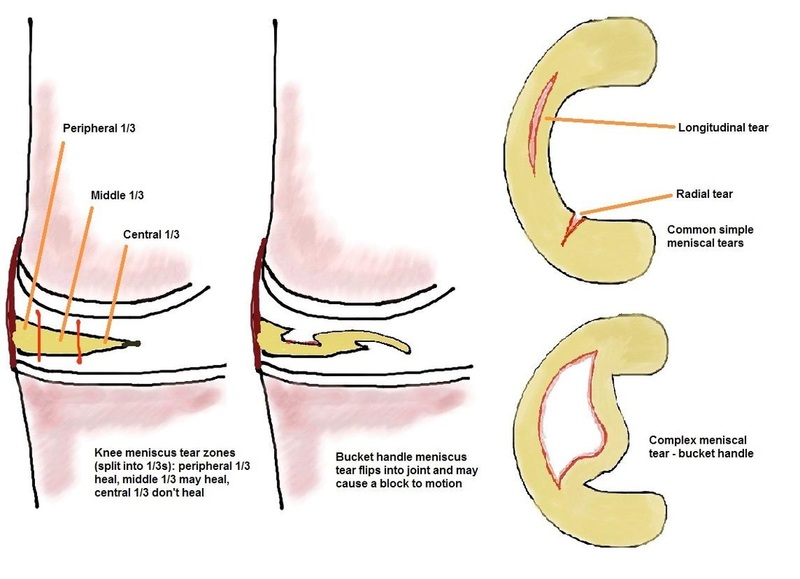 Symptomatic degenerate, chronic meniscal tears (usually seen in patients over 40 years of age), often involving the posterior horn of the medial meniscus, may be treated with arthroscopic meniscal debridement. Total excision of a meniscus leads to early development of osteoarthritis and is never performed. The ACL is an important stabilising structure of the knee, providing anterior translational and rotational stability. Rupture occurs in sportsmen with a non-contact twisting injury resulting in sudden pain and immediate large swelling/haemarthrosis. guidance of physiotherapists, working on quadriceps strengthening and hamstring control. If the patient suffers knee instability despite this rehabilitation, ACL reconstruction surgery may be considered. ACL reconstruction is classically performed arthroscopically and may utilise tendons harvested from the patient’s hamstrings or part of their patellar tendon. Tunnels are drilled in the tibia and femur at the sites of the native ACL attachments and the tendon graft secured at these points to form a substitute cruciate ligament. Prolonged rehabilitation is required following this surgery to allow return to sport. Varus deviation of the hallux (big toe) metatarsal will lead to a valgus angulation at the metatarsophalangeal joint (MTPJ), termed hallux valgus. 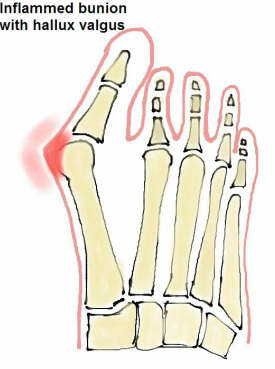 This angulation will result in a prominent bump (inflamed capsule, bursal tissue and joint osteophytes) on the medial side of the joint, which is referred to as a bunion, and may cause pain and rubbing on shoewear. After investigation with X-rays, treatment is decided on according to the patient’s symptoms. Hallux valgus may be treated non-operatively with accommodative wide shoes and avoiding tight shoes. Surgery corrects the underlying deformity of the great toe to alleviate symptoms and should never be performed for cosmetic reasons alone. There are many described procedures that involve correcting soft tissue balance around the MTPJ and excising the bunion in minor deformity. Correction of greater deformity involves cutting and realigning the metatarsal and sometimes the proximal phalanx, combined with soft tissue procedures. All of these procedures have a risk of recurrence of deformity and hallux valgus may eventually lead to MTPJ osteoarthritis, which if symptomatic, can be treated with fusion of the joint in the corrected position.